The dog sits on the stainless-steel examination table. “Maybe we should muzzle her, so no one gets bit,” the veterinary assistant says. “She’s deaf, it won’t help,” the vet says. 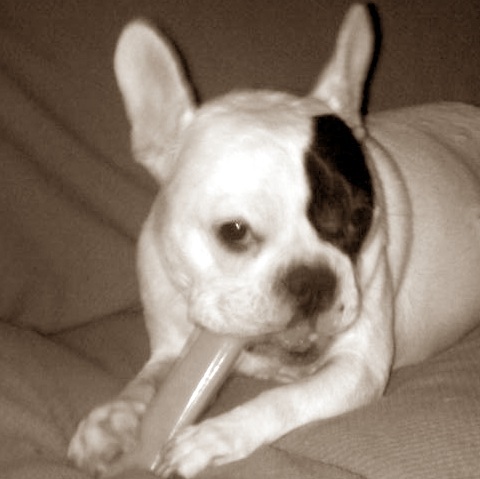 And, I’m astounded that veterinary medical professionals are acting as if my 22 lb., 4-year-old French Bulldog is a viscous alien – just because she’s deaf. And, Lola, my little white fluff-ball with a black ring around her eye like the dog from Our Gang, just sits there, looking at the vet staff like they’re all insane. And, she’s right – these medical professionals are acting like idiots, as if they’ve never seen a dog before, as if a deaf dog completely throws out every rule of veterinary medicine, as if my sister and I entered the clinic with an unknown creature on a purple dog leash. It’s a freakin’ dog who hasn’t been eating normally and has been vomiting – this isn’t a paleontological mystery!, I want to scream. “Just examine her – she’s a normal dog,” I say. Of course, Lola is a normal dog physically, but being deaf-from-birth, she has developed extraordinary skills. As cliché as it sounds, she runs circles around my English Bulldog when it comes to using her senses (which might not be that impressive since all my English Bulldog wants to do is sleep on the couch or bark at the clothes drier). Lola is astoundingly visual, reading facial expressions, if not lips. We speak commands to her, and as long as she’s looking at us, she responds. And, she has an uncanny sense for vibrations. She knows before the rest of us that a car has pulled in the driveway, and when she’s sleeping on the floor and my wheelchair or footsteps pass by, she awakes. In fact, if you didn’t know Lola was deaf, you’d never have a clue – she’s just an alert, happy, hyper little dog buzzing around the house. But, the vet knows that Lola is deaf, and it clearly freaks out her and her staff. Lola looks and acts like any other dog at the vet clinic, but the fact that it lists her as deaf on her medical chart changes everything, making her “disability” more perception than reality. If she wasn’t deaf, would you ask her a litany of questions, expecting a verbal response from her? I wanted to say but refrained. Really, because a dog is deaf, it’s tough to tell why it’s vomiting? What kind of asinine correlation is that? Clearly, a Critical Thinking course isn’t part of the curriculum for veterinary medicine. With my sister and I advocating for Lola, she’s finally X-rayed, gladly finding no internal blockages – no rubber balls or cotton socks in her digestive tract – and she’s ultimately diagnosed as having a stomach virus, prescribed a diet of boiled hamburger and rice. In short, the dog’s vomiting got it prescribed a personal chef – ingenious! And, as I pay the $258.14 bill at the check-out counter, with Lola standing beside me, her panting, pug-nosed face pointing toward the door, wanting to go home, I’m again reminded of how shockingly ignorant the medical field can be toward those of us with disabilities – dogs or humans, no matter. Lola is adorable, she’s a lucky dog to have you and I’m glad she’s ok! But I really think you need to find a new vet. Seriously, the vet and the tech don’t know how to react to a deaf dog? That troubles me. Alien on a Leash is a great title for this blog. I can’t believe the Vets acted like that just because Lola is deaf. There is something just wrong about that. I would find another vet. Our dog had the same problem with her stomach and our vet told us to do the same thing with the hambuger and rice. She got better after a few days. We did slowly take her off it by adding her regular food in with it and then we didn’t give her the rice and hambuger at all. I hope Lola feels better. What a cool dog! The vet’s is pretty goofy though. Your observations are so true, one simple difference (disability) in a person or animal and some people loose all common sense and are incapable of rational deduction.